Hundreds gather inside City Council Chambers December 4, 2017 to rally against a bill introduced by Councilwoman Cindy Bass that would force beer deli owners, many of whom are Asian immigrants or their descendants, to take down protective safety windows in their establishments. After a nearly daylong hearing attended by more than 200 protesters, a City Council committee Monday approved a measure that would give licensing officials the authority to ban safety glass windows inside beer delis. City Councilwoman Cindy Bass called it a win for everybody — but beer deli owners and their advocates were not happy. The initial bill, as introduced by Bass, would prohibit beer delis and other food establishments that sell alcohol from maintaining or erecting barrier windows between food workers and customers. Bass had called the windows an "indignity," saying it felt as if beer deli owners were serving food to customers considered dangerous or in "prison." Councilwoman Cindy Bass, chair of the Committee on Public Health and Human Services, gives an opening statement concerning a bill she introduced which would prohibit beer deli owners from having protective safety glass separating them from their customers. After hearing 22 witnesses testify — most in favor of the bill — the seven-member Committee on Public Health and Human Services, chaired by Bass, passed an amended version. The bill now instructs the city's Department of Licenses and Inspections to "promulgate regulations to provide for the use or removal of any physical barrier" in places that serve food and alcohol by no later than Jan. 1, 2021. The amended bill is expected to go up for a full Council vote Dec. 14. "What we're asking L&I to do is come up with some regulations," Bass said after the hearing. The issue regarding the barrier window is still "on the table," she said. Adam Xu, chairman of the Asian American Licensed Beverage Association of Philadelphia, said he found the amendment "very confusing." He testified passionately that if beer delis were ordered to remove protective windows, other businesses including banks and gas stations may be next. "We try to be better neighbors," he said of his association, which he said represents 230 beer delis. "If you can come up with a law to give us better protection, … we will probably tear down this bulletproof glass [ourselves]." Hundreds gather outside City Hall December 4, 2017 to rally against a bill introduced by Councilwoman Cindy Bass that would force beer deli owners to take down protective safety windows in their establishments. 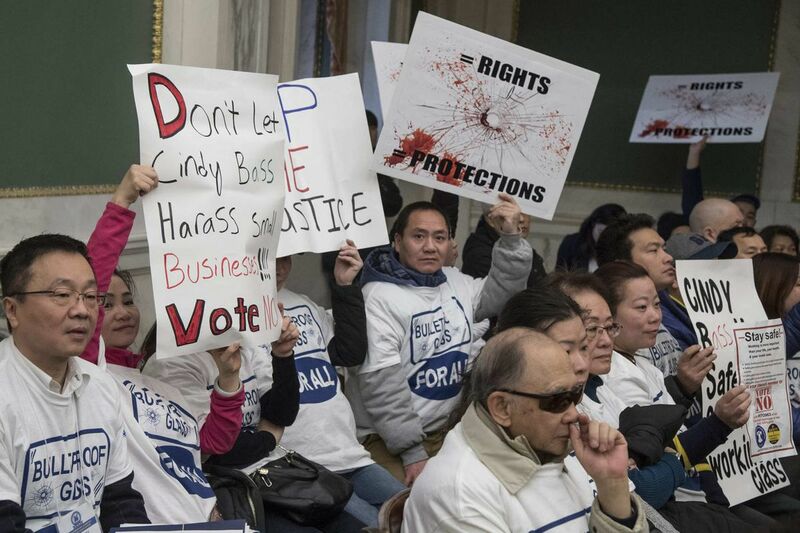 More than 200 Asian immigrants or their descendants — beer deli owners and their supporters — attended the hearing to show support for the protective windows. State law requires businesses selling malt liquor or beer to have tables and chairs sufficient for 30 people and to regularly prepare and sell food. Bass' bill would require those types of businesses to apply for a large-establishment license instead of a small-establishment license. It would apply to beer delis, but not to takeouts that don't sell alcohol. David Perri, L&I commissioner, and Thomas Farley, the city's health commissioner, both testified in support of Bass' bill — including the proposed removal of barrier windows. Farley spoke of the need for restaurant workers to be able to help customers quickly — if, for example, a patron were choking. Perri said businesses that would need to apply for a large-establishment license should be places where a family could go for a meal. Bass said after the hearing that beer deli owners "need to decide what they want to be. Do you want to be a restaurant or a beer distributor?" Retail beer distribution outlets would be allowed to have the barrier windows, she said. Chi-Ser Tran, a lawyer whose parents own a North Philly beer deli, called the amended bill "really upsetting" and "not great." "We'll keep fighting and making sure there's communication between both sides," she said. Others who testified, including African American residents and business owners, said beer delis encourage alcoholism and drug activity. They said they wanted the partitions to come down. Supreme Dow, founder and executive director of the Black Writers Museum, said a barrier window in a business "is impersonal." "It says to the community: 'I don't want human contact,'" he said. "Maybe they [beer deli owners] should consider relocating" if they don't want to change, he said. The Rev. Ed Smith of Enon Tabernacle Baptist Church also supported Bass' bill. "The reality is this: If you want to change the nature of the corner, you have to change the nature of the corner store," he said. One witness, Kevin Kim, 53, of Horsham, sought common ground. In a calm voice, he testified that his parents had owned a grocery in West Philadelphia in the 1970s. "I am not a supporter of beer delis in inner-city neighborhoods," he said. He told beer delis owners they should "think twice" about selling beer in the morning when "children are on the streets walking to school or going to the bus stop." But he also said that banning the safety glass used by some business owners is not the solution. Directing his comments at Bass and other Council committee members, he said: "Will you be responsible if a store owner, their employee or customer gets killed?" City Councilman At-Large David Oh, who is not on the committee, said the amended bill would jeopardize beer deli owners. "Instead of supporting business owners' discretion to decide what is best for their own establishments," he said in an email, "my colleagues will immediately threaten their safety and freedom if this bill is adopted by City Council." Editor's note: This story was updated Dec. 11, 2017, to remove the word "plexiglass" to avoid any reference to the trademarked Plexiglas® product.